Wobbuffet in game: 799 Who? Important notice! Pokemon Wobbuffet is a fictional character of humans. Jessie has a Wobbuffet that frequently emerges from his Poké Ball to shout his name or cause what Jessie considers to be trouble. He has appeared in almost every episode since she accidentally traded her Lickitung for him in Tricks of the Trade. She rarely uses Wobbuffet in battle, but when she does, the results are generally good. On the other hand, Jessie's few attempts at using Wobbuffet in Contests have all had negative results. He was left at Team Rocket's headquarters prior to Jessie, James and Meowth's departure to the Unova region. He was later reunited with Jessie when the trio returned to Kanto, and he was the only one of Jessie's Pokémon to accompany her to the Kalos region. A female Wobbuffet appeared in A Fork in the Road! A Parting of the Ways! under the ownership of Dr. White. 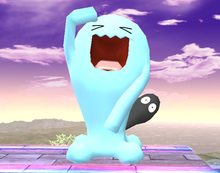 A Wobbuffet appeared as a plush toy in A Jolting Switcheroo!. EP146 Wobbuffet Ash's Pokédex Wobbuffet, the Patient Pokémon. 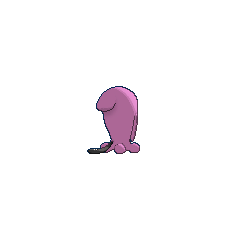 Wobbuffet like to live in dark areas so they can keep their pitch black tail concealed. Wobbuffet first appeared in Absolutely Azumarill under the ownership of Crystal's mother. 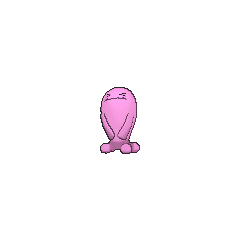 Another Wobbuffet appeared in The Last Battle XIII as one of the Pokémon sent to help the fight in Ilex Forest. 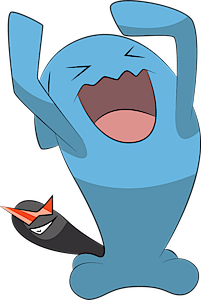 If the opponent does not attack Wobbuffet, Wobbuffet cannot harm the opponent except with Struggle (itself unusable unless Wobbuffet has run out of moves). 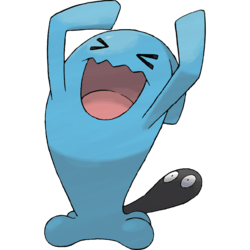 Wobbuffet may be based on the late Japanese comedian 林家三平 Sanpei Hayashiya, who was famous for repeatedly touching his hand to his forehead while saying one of his trademark lines, そうなんす、奥さん sō nansu, okusan, "That's the way it is, ma'am." In addition, its form and available moves may be based on a punching bag; that is, when it is hit, it bounces back. Alternatively, it may be based on the concept of Karma as it can only cause damage if it is attacked first. 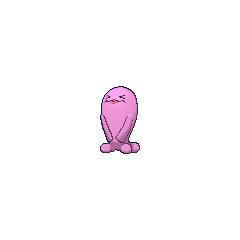 Wobbuffet may also be based on an Okiagari-koboshi doll, a Japanese traditional doll with squinted eyes that stands back upright when pushed over.